Is it possible to achieve the health related MDGs without a special focus on the health status of the poor, the marginalized and the hard-to reach in Kenya? The Government of Kenya being signatory to the Millennium Declaration is obliged to put in place measures for achievement of the Millennium Development Goals (MDGs). While only three of the eight MDGs relate directly to health, all others have important direct effects on health considering the interrelationship between health and development in general. The core health MDGs are Reducing Child Mortality (MDG4), Improve Maternal Health (MDG5), and Combat HIV/AIDS, Malaria and other Diseases (MDG6). Achieving the health related Millennium Development Goals (MDGs) will not be possible without a special focus on the health status of the poor, the marginalized and the hard-to reach in Kenya. This post examines the evidence to support this position utilising findings from the 2008-9 Kenya Demographic and Health Survey (KDHS), with regard to the following selected indicators: Under-five mortality rate (MDG4.1); Percent births attended by skilled attendant (MDG5.2); Contraceptive prevalence rate (MDG5.3); and Unmet need for family planning (MDG5.6). Analysis of the data on the various health indicators shows vast disparities exist based on socio-economic status and the area of residence (see Table 1). These disparities have persisted in results of successive national surveys over the last three decades. Generally, the national average statistic is used in reports regarding achievement of goals (national or international). However, such data is not particularly useful when it comes to designing interventions to improve on the health indicators, since it fails to direct attention to where greatest need for intervention exists. Under-5 Mortality Rate (MDG4.1): Nationally there has been significant improvement in child survival in the last decade which could be attributed at least in part to childhood immunization coverage and malaria prevention interventions. However, analysis of the data by region shows there are areas in this country where child mortality rates remain very high. Whereas there was a 28 percent reduction in under-five mortality rate in Nyanza from 206 deaths per 1,000 reported in 2003 to 149 deaths per 1,000 in 2008/9, the region remains the place with the highest child mortality rate in Kenya. Almost one in seven children in Nyanza dies before attaining his or her fifth birthday, compared with one in 20 children in Central province (51 deaths per 1,000), which has the lowest rate. The risk of dying before age five is almost three times higher in Nyanza than in Central province. 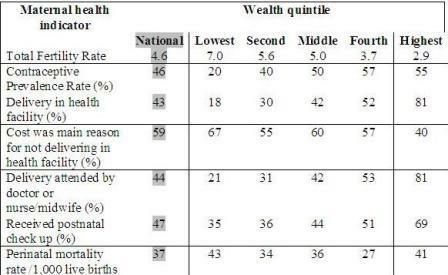 The other variables shown in Table 1 which influence child survival are mother’s level of education and household wealth status. Under-five mortality is noticeably lower for children whose mothers either completed primary school (68 deaths per 1,000 live births) or attended secondary school (59 deaths per 1,000 live births) than among those whose mothers have no education (86 deaths per 1,000 live births). However, under-five mortality is highest among children whose mothers have incomplete primary education. 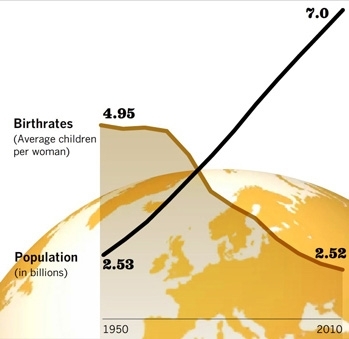 Similar patterns are observed for infant mortality levels (not shown). Child mortality rates generally decline as the wealth quintile increases, though the pattern is not uniform. Skilled attendance at delivery (MDG5.2): The policy of the Ministry of Health as stated in the National Reproductive Health Policy (2007) is that all women should have access to skilled attendance throughout the continuum of pregnancy, childbirth and postpartum periods, and that the Traditional Birth Attendant (TBA) is no longer recognised as a skilled attendant. Overall, the data shows that only 44 percent of births in Kenya are delivered under the supervision of a skilled birth attendant, usually a nurse or midwife, and that TBAs continue to play a vital role in providing delivery services. Almost 28 percent of births were assisted by TBAs, the same percentage as were assisted by nurses and midwives. As expected, births in urban areas and births to mothers who have more education or wealth are more likely to be assisted by medical personnel than are those births to mothers who reside in rural areas or who have less education or wealth. Regional differentials in type of assistance at delivery are also pronounced, with Western province recording the lowest proportion (26 percent) of births assisted by medical professionals, followed by North Eastern province (32 percent). Nairobi has the highest proportion of births assisted by medical personnel (89 percent). Contraceptive Prevalence Rate (MDG5.3): Married women in urban areas are more likely to use a contraceptive (53 percent) than their rural counterparts (43 percent). Contraceptive use increases dramatically with increasing level of education. Use of any contraceptive methods rises from 20 percent among married women in the lowest wealth quintile to 57 percent among those in the fourth wealth quintile, and then drops off slightly for those in the highest wealth quintile. The North Eastern Province had the lowest CPR of 4 percent. Unmet need for FP (MDG5.6): Levels of unmet need for family planning remain high among Kenyan women, with nearly a quarter (26%) of currently married women indicating that they have unmet need for family planning. Unmet need for family planning is higher in rural areas (27 percent) than in urban areas (20 percent). Nyanza province has the highest percentage of married women with an unmet need for family planning (32 percent), followed by Rift Valley province (31 percent), while Nairobi, North Eastern, and Central provinces have the lowest unmet need at 15-16 percent. Married women with incomplete primary education have the highest unmet need for family planning (33 percent) compared with those with completed primary education (27 percent), no education (26 percent), and secondary and higher education (17 percent). Unmet need declines steadily as wealth increases, from 38 percent of married women in the lowest quintile to 19 percent of those in the highest quintile. What we learn from these findings in KDHS is that vast disparities persist according to spatial distribution and socio-economic strata of the populations; this implies that we cannot achieve health related MDGs without bringing on board all including the poor and marginalized groups. Forgetting them is not an option! The GOK needs to openly recognise that achievement of MDGs will remain an illusion so long as current disparities in access to health care persist. There needs to be concordance between policy statements of equity and practice; commensurate allocation according to need. Hopefully the devolved county governments will make use of disaggregated data in their planning and budgetary processes, and ensure equitable access to health care for all. That the attainment of Millennium Development Goals 5 will ultimately depend on the progress made in other social and economic goals is clear from the data shown in Table 1. Poverty reduction measures, equitable resource allocation and especially empowerment of women, all come out as critical strategies and necessary preconditions for attainment of improved maternal health in Kenya. The level of a woman’s education, a poverty related variable (Figure 1), is also a proximate determinant of the poor maternal health outcomes in Kenya. Taking the example of skilled attendance at childbirth, the 2008-9 KDHS showed that the percentage of deliveries that were attended by a skilled attendant (doctor or nurse/midwife) was lowest among mothers with no education at all (19%), it was slightly above the national average of 44% for women who had completed primary education (49%), and highest among those with secondary education and above (73%). •	What are the prospects of achieving ‘skilled attendance’ for all births in Africa? •	What’s in the way of achieving improved maternal health in Kenya? •	Will the poor in Kenya enjoy the “Right to Health”?